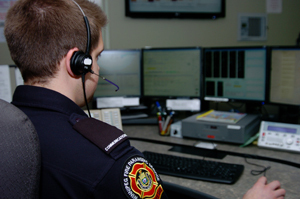 The WFPS Communications Centre is responsible for coordinating and dispatching all emergency and non-emergency calls for service for EMS and Fire calls originating in Winnipeg. 23 ambulances and approx 59 fire resources and two MIRV buses are used by the two dispatchers daily. Advanced booking of non-emergency calls is encouraged and can be accommodated up to thirty-one days in advance of the date on which service is needed. Transfers with destinations out of the city are not coordinated by our Center. In 2007 the Winnipeg Fire Paramedic Service implemented a major change to the Communications Center and merged the two dispatch centers of Fire and EMS. The Winnipeg Fire Paramedic Service is a secondary public safety access point. Winnipeg Police Service triages all initial 911 call and routes call to us for Fire or EMS assistance. We dispatch to calls for service for the City of Winnipeg up to and including the Perimeter Highway, St Norbert and Grand Pointe area. An Automatic Vehicle Location (AVL) System using Satellite technology is used to track the location of all our Fire and EMS vehicles. This allows the dispatch of the closest, most appropriate, ambulance or fire apparatus to the incident. The system design includes dispatches to Electronic Patient Care Reports (E-PCR) to all EMS and supervisor vehicles. The Communication Centre sends calls electronically to the station monitor/printers in all halls, and for processing at administrative locations. The Center is staffed 24 hours a day, 7 days a week, 365 days a year. The minimum number of personnel on duty at any one time is 5; typical shift staffs 7 and 1 Communications Center Supervisor. All shifts are two 12-hour days followed by two 12-hour night shifts and with 4 days off on a rotating basis. The communications Operators Call taker responsibilities include: obtaining the address or location of the emergency, the telephone number of the caller, the nature of the problem and assigning the dispatch priority. Everyone who works in the Communications Center takes 911 calls. Dispatchers are responsible for maintaining emergency coverage throughout their area, and the areas surrounding the City of Winnipeg. They monitor and facilitate field Fire and Paramedic staff, handle inquiries and coordinate efforts with allied agencies. Winnipeg Fire Paramedic Service provides in-house, intensive training for our staff. Each person has undergone specific training for the Center and must complete our intensive 2 month, 340 hour- 911 Communications Course. This includes intense practice scenarios and real time call evaluations with a training supervisor. (PDF) What Happens When I Call 911? P. A. C. E. R.